Friends having dinner party at home. “We are what we eat” – goes the well-known aphorism. Not only WHAT matters, but HOW is also important. The tips below are useful to know before accepting a lunch or dinner invitation from a Russian friend. Russians are flexible about the time for lunch and dinner, and it varies from family to family, as well as from individual to individual. Restaurants serve different types of food at any time, which is not the case in other countries such as Italy, for example. When expecting a guest, Russians are also flexible about the time. If someone is late for dinner then he or she can eat alone. There’s flexibility not only with arrival but also with the order in which dishes are served. 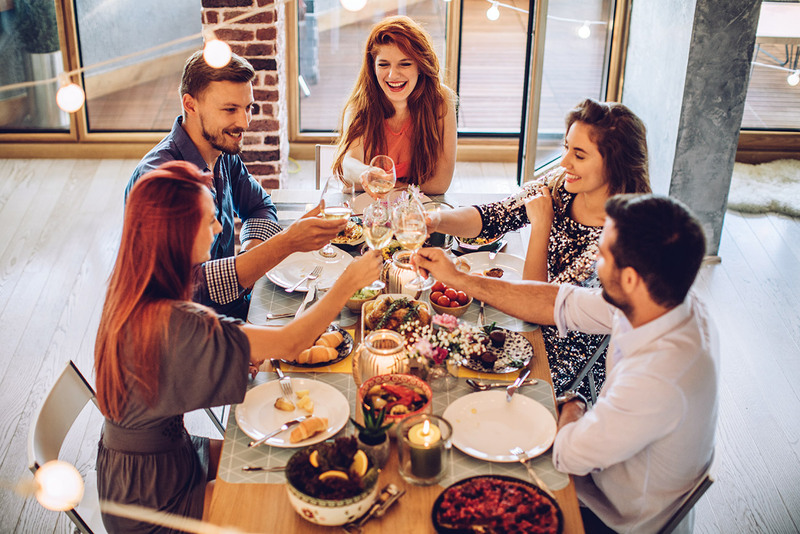 A dinner’s structure is not strict, although a meal usually includes soup, salad, meat or fish, as well as a side such as rice, potatoes or lapsha (Russian spaghetti), and finally dessert. Nevertheless, you can skip any part from this list, or change the order. “I found it very surprising that my Russian relatives, after the main course and dessert, would chat as they started eating salty things. It was non-stop eating,” recalls an Italian man, Nino, about his experience at a Russian dinner during the week of New Year celebrations. Nino was especially confused because the order of courses changed from house to house, and he could never be sure if, for example, a cutlet should be eaten after herring-under-fur salad, or before. Therefore, the main thing that you need to know about eating habits in Russia…Forget all the rules! Rule 2 - Don’t eat dry! There is, however, one important unwritten rule during a Russian meal. Many mums say to their kids: “Don’t eat dry!” It means that while eating you should also drink something. The logic behind this is that it’s easier to wash food down with a liquid and it might also help digestion. So don’t be surprised if together with the main course you get a cup of hot tea! Another option is to add soup to the meal, for example, if you have only a sandwich. What’s really important is to have meat during lunch or dinner. Russians usually eat meat every day, and despite the fact that the number of vegetarians is increasing in the country, it’s still not easy to find a middle-aged Russian vegetarian. “Meat should be included in your daily meal, I couldn’t survive without meat for even a single day,” said Yura, who does not understand the surprise of his German wife on this issue, as well as Italian colleagues who are happy with a lunch composed of lettuce and tomatoes. The Russian winter, however, is long and cold and people need a lot of calories to survive. That’s why bread is offered together with almost any dish. Probably that’s because of childhood hunger, and so every Russian granny will tell you that bread is “the head of everything,” and will eat even a watermelon with bread. Rule 4 - Afraid to catch a cold? Eat onions and garlic! What else can help survive winters and protect the immune system? “There’s an obsession with eating raw onions and garlic with dinner and lunch. Russians claim this helps prevent getting a cold. I never tried and I also never got sick,” said German/Dutchman, Alex, who worked in Western Siberia for four months. In fact, raw onions are common ingredients in Russian salads and there’s a tradition of eating a crust of bread with mashed raw garlic on top. Rule 5 - Dill should be everywhere! Do not expect to find varieties of spices in Russian dishes except for maybe black pepper, bay leaf and dill. As a gourmet and food lover, Nino is surprised that Russian cuisine is dominated by onion and black pepper. There’s a famous expression that Russian moms tell their kids, “When I eat, I'm deaf and dumb.” That advice is given for safety reasons: when you’re talking and eating you can easily choke. This might be the reason why Russians appear anti-social while eating: they’ve learnt this rule from childhood. “It seems Russians eat more for nutrition; a meal is definitely not a social moment if compared with France or Portugal,” says Claire who has lived in Russia four months. But if you want to break the ice, then bring vodka or tea to the table! You might have read many articles about vodka traditions and hospitality in Russia, but tea, not vodka, is the main drink in Russia, and usually served with cookies or cakes. It’s a genuine social moment when drinking tea together. This is the time when the main meal has finished and people are relaxed and start chatting. As soon as you enter any Russian house you’ll always be offered tea, and when you finish then your cup will be refilled immediately. This is a hospitality gesture; it’s like giving knitted socks as a present - the goal is to make you feel warm inside when it’s cold outside. A guest is the most important person during dinner, and a host will always try to please the guest as much as possible. “People were focused so much on serving the guests that I felt uncomfortable. It’s like when you go to the restaurant, the host serves you and does not eat himself,” said Nino about his feelings during a Russian dinner. But why is too much hospitality a reason to complain?